Unlike Malala he is not a global celebrity, nor has he been feted internationally – either by media or governments. In fact not many had heard of him even at home in India. “Who is he?” asked many. The low-profile activist is the seventh Indian to win a Nobel Prize. 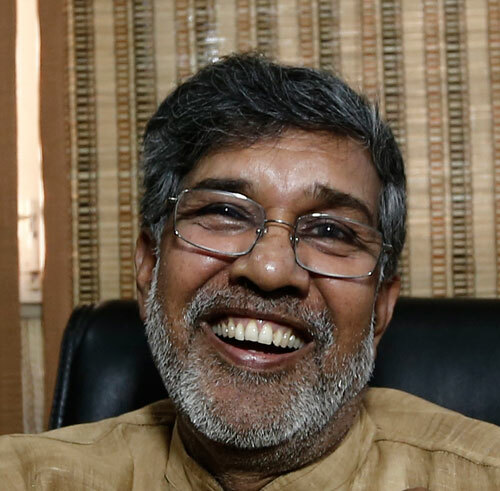 Kailash Satyarthi, 60, has been campaigning in Gandhian manner against child labour, bonded child labour (a form of slavery), and for better education of children in South Asia. Born in Vidisha, Madhya Pradesh, his father was a police officer. Kailash gave up a career as an electrical engineer and "dedicated his life to helping the millions of children in India who are forced into slavery by powerful and corrupt business- and landowners"
Courageously mounting raids on factories and carpet-making units where children were usually employed in terrible working conditions, he has had to face violence many a time. "Since 1980, he has led the rescue of over 75,000 bonded and child slaves in India and developed a successful model for their education and rehabilitation. Kailash has emancipated thousands of children from bonded labour, a form of slavery where a desperate family typically borrows needed funds from a lender (sums as little as $35) and is forced to hand over a child as surety until the funds can be repaid," the RFK Center says.